One thing I miss about going to work on a daily basis is getting the chance to appease cravings when they occur. If I feel like having sushi, it’s a small matter to drop by a Japanese restaurant on the way to work. Want pasta? I can troop over to a pasta place during lunch break. 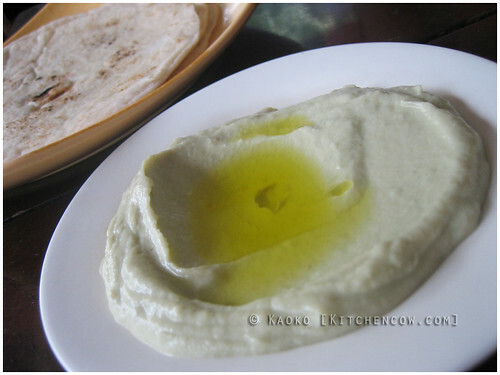 Now though, I find myself staring at long forgotten, unposted photos, craving madly for shawarma and kebabs. 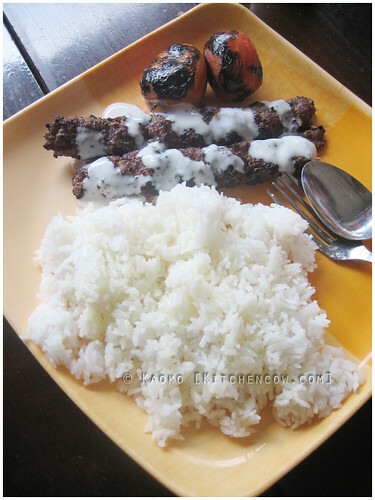 The cause of sudden cravings—this chelo kebab photo! The pictures I unearthed were from Mister Kabab, a small chain of Persian restaurants scattered in Quezon City. It wasn’t a typical restaurant—there was no airconditioning, and it resembled a giant school cafeteria more than anything. It’s popular, nevertheless, because of its cheap prices, bigger than average servings and operating hours. Bar hoppers and midnight snackers love going there to satiate after hours cravings. It’s shawarma. On a plate! I found their shawarma plate interesting. 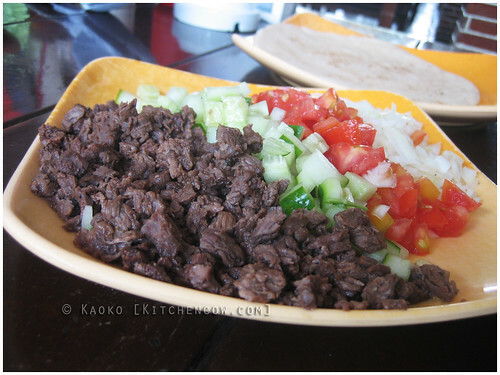 Instead of the usual rolled up shawarma, they serve a big plate of shawarma fixings: beef, cucumbers, tomatoes and onions, along with a some pita bread, letting you put together your own sandwich. This definitely makes for bigger than average shawarma. I tried the chelo kebab, one of the most popular things in the menu. It featured two skewers worth of meat, rice topped with butter and grilled tomatoes. Topped with a garlicky yogurt sauce, it fills you up and hits the craving spot. Easy to see why it’s a great place to fill-up after a long night of drinking and dancing. I’d love to see a Mister Kabab in the South. While the flavors aren’t blow-me-away-spectacular, it’s satisfying enough and quite filling. Factor in the affordability and long store hours, I can see myself here a lot, if only it were nearby. my favorite kebab place is ZIGGURAT at makati avenue. fantastic food + 24 hour service = FYEAH! Once Cooper is potty-trained, we go! Badly need kebab fix. persia grill in makati is also good. Waah! I miss Mr. Kebab and also their yogurt shake! And yeah, nothing really spectacular about the place, but you can’t help it, you just need to go back. It’s the same satisfaction you get when you eat at your favorite lugawan or tapsilogan sa kanto. You nailed it. It’s perfect for satisfying the craving. Instant gratification, kahit na it’s not the world’s best evar. Swak na swak pa rin. You got me craving for Mr. Kebab! Buti nalang nasa QC lang ako! Yes please? Haven’t been there. Will wait for you and Cla to get back. Hopefully, emopup can be left at home na.